Rugby Road III – available NOW! We’ve been around since before Nevermind, before there was an Achtung Baby, and even before Use Your Illusion 1 AND 2. Its been over 25 years since we started this juggernaut and we are thrilled to still be doing it. We are extremely proud to release Rugby Road III – all new music by the same three guys that have been at it (together) for almost three decades. If you are late to the party, Rugby Road is Kenny Kearns (vocals, keyboards, bass, guitar, etc. ), Rich Pruett (drums, percussion and vocals), and Derek Smith (“Smalls”) on guitars and vocals. We’ve been lucky enough to have shared the bill with some of our heroes, including The Allman Brothers Band, Phish, Maceo Parker, Bill Kreutzmann and Peter Freaking Frampton. “III” sees Rugby Road drawing from a wide range of influences in a cohesive rock EP, showcasing the bands contemporary songwriting with an ability to push to new boundaries in guitar-based explorations. Kenny Kearns’ older-and-wiser songwriting compliments Rich Pruett’s stylistic range in drumming while Derek Smith’s guitar provides the common thread connecting the songs. III is a four song collection that highlights the chemistry that comes with over 25 years of the trio playing together as Rugby Road. The band has been somewhat underground – by design – but still regularly performs live and, along the way, has played many of the major venues in the region and shared the stage with a diverse range of artists including the Allman Brothers Band, Maceo Parker, Rusted Root, Bill Kreutzmann, Phish, Peter Frampton, Dirty Dozen Brass Band and more. Rugby Road became a regular in the late 90’s New York City Wetlands scene, playing regularly at the famed NYC venue before hunkering down in Philadelphia to play “on their time” (in other words, they got married and had kids). Known for their live shows and intricate arrangements, they released two independent original records – 1998’s Times Already Happened, and 2001’s Different Degrees. Although associated with the jam-band scene, Rugby Road’s extended explorations are steeped in more traditional classic rock roots of Pink Floyd, Exile-era Stones and Traffic – than some of their jam-band counterparts. Rugby Road’s III finds them thriving creatively while pushing their limits artistically in a concise, contemporary – and rocking – 4 song EP. It is a record that reflects the confidence and independence of a band that does things their own way. 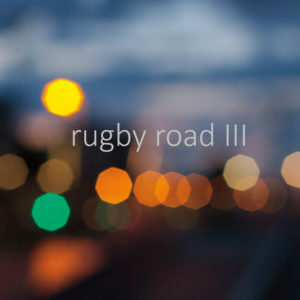 Rugby Road III will be available on standard CD and all digital download formats. The album is available through the bands website now.